HomeOffice Plants Tips & IdeasArtificial Office Plant Rental Packages! Moore Park Plantscapes is excited to announce a new service: Artificial office plant rental packages! We are pleased to have recently enjoyed substantial ‘growth’ in our sales of artificial plants for offices. It is fast becoming a significant focus of our business. The quality of the material available to custom build life-like artificial plants and trees has increased over the past decade. This, combined with the many benefits of using artificial plants in an office has allowed us to present this as an alternative to live plants. We now offer the choice of purchase or rental to give our customers even more flexibility. Why consider artificial plants? Artificial plants are a great solution to adding greenery to areas that may not support live plants. Many offices in the downtown core do not have good natural light due to the density of surrounding high rise buildings. Often boardrooms and offices are built on the inside of a work area and do not have windows. Artificial plants are cost effective; they do not require regular maintenance. A cleaning every few months will keep them looking their best. With no light restrictions, artificial plants give you maximum flexibility in design. You can use any type of plant in any space. Our clients often want to dress up meeting rooms with plants. With live plants, we need access each week for maintenance. This can often be a problem when meeting rooms are frequently in use. Artificial plants eliminate the need for access. Why rent artificial office plants? Renting eliminates an up-front expense. One low monthly payment covers the cost of the plants and containers. We offer three packages at different price levels, or you can create a custom package. Click here for details. 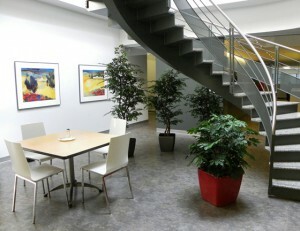 http://mooreparkplantscapes.ca/artificial-plants-office-rental-packages/ The rental term is only one year. At the end of the year, you may keep the plants and continue to rent with a 20% discount on the monthly fee, or start over with all new plants and containers. This feature allows you to refresh your plantscape every year. Our artificial office plant rental packages allow you to choose a variety of floor and table-top plants. Accent florals are also available to add to the packages. Check back soon to learn more about our new artificial floral line.